Newbridge Heating Centre provides a fantastic selection of fires, stoves, fireplaces and cooking equipment, all supplied and fitted to the highest standards. 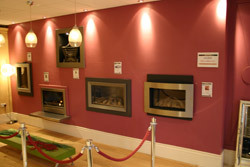 The beautiful range of products at Newbridge Heating Centre are ideal for all budgets and tastes. Our showroom boasts a fabulous range of gas stoves, built-in gas fires, fireplaces, solid fuel & wood burning stoves and built in wood burning fires to cater for all needs. The latest in wood burning technology is now also available in store. On live display is a fantastic range of high efficient gas and solid fuel fires that could be the ideal upgrade option for existing low efficiency fireplaces. The showroom includes working display models of all fuel types for you to experience. Owned by A.N. Heating Ltd, Newbridge Heating Centre have been operating in the heating business for many years. We are a family owned business with over 40 years worth of experience in the heating sector. We specialise in the supply and installation of all types of conventional and renewable heating systems and heating appliances. Our company primarily operates in the Kildare region but regularly carries out installations throughout Leinster and farther a field. Newbridge Heating offers a full installation service with highly qualified, friendly professionals. Our sales team will happily arrange a free survey of your central heating and fireplace requirements. Our aim is to deliver quality, value and exceptional service to you by taking full responsibility for the design, installation and service of its products. The opening hours of Newbridge Heating Centre are: Monday to Friday 9.30am-5.30pm and Saturday 10am-5pm. For further information phone: 045-449236, email info@newbridgeheating.ie or visit our website at www.newbridgeheating.ie .